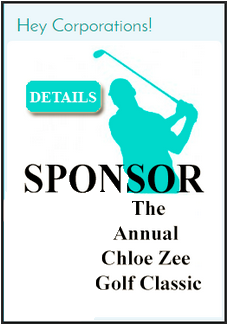 The first golf tournament was in October of 2011 right after Chloe was diagnosed. It was to raise money for medical expenses. It was a huge success, raising over $32,000.00. Chloe was diagnosed September 8th, 2011 and fought with all her might for 10 1/2 months when she lost her battle to that evil beast. At this time we decided to have another tournament and have the tournament support The Central and North Florida Make-A-Wish Foundation, The Chloe Zee Scholarship, The Cameron Zee Scholarship and to help local families in need of assistance that have children with life-threatening diseases. In 2015 we decided to always have this annual tournament the last Sunday in September of every year and support the same charities. 2015’s tournament we added some fun activities and food vendors. There was a putting contest and a chipping contest before the tournament began. There was also a continental breakfast. We sold 50/50 tickets which means if your ticket gets drawn you get 50% of the pot and the other 50% goes to the Foundation. We sold Super Packs for extra strokes, putts and easy outs of the sand. We also added three different food vendors on the coarse in different spots along with a shot station of Rumchatta and Fireball. We had a silent auction set up to view before dinner and stayed up during dinner and you could bid at your leisure. We do something different than any other golf tournament. We sell “In Memory of Signs” for those who have lost a family member to cancer and “Survivor Signs”. All the “In Memory of signs” are put down the side of the 2nd hole. The Survivor Signs are put down the side of the 6th hole. First year for this was 2015. Everyone was so touched and loved that they were displayed the way they were. Of course the price of golf includes dinner! We also offer dinner only tickets. This year will be quite similar. We will be selling the 50/50 tickets and super tickets at registration. We will have a grab and go breakfast, food vendors, a unique putting contest and the chance to win a car on three of the par 3’s by getting a hole in one and contests along on the course. It is a great tournament and for the best causes. We hope to see this tournament grow and grow in memory of Chloe.